Kryo's Power (pump-action sniper) can spawn with the Cyclops sight. For more on this weapon click on the link below. Semiautomatic Sniper Rifles also share specific parts with the traditional Sniper Rifles. If a part is not listed, then it does not exist specifically for the Semiauto Sniper Rifles. You should utilize the above link, where you'll find the codes for the rest of the parts needed from the standard "Sniper Rifle" reference list in order finish constructing your rifle, such as stocks or sights. acc.acc1_Brisk - - 50% - - 50% reload speed, increases the fire rate and gives faster reload speed. acc.acc2_Explosive_Torgue_Cobra - - -100% 12 - "Explosive"/High explosive damage, always procs, large splash damage from proc. acc.acc3_SandS_Orion_Shock - - - 10 - Add 4 rounds, "Orion"/Large magazine, high shock damage, shots can ricochet of walls and split into 3 or 4 weaker projectiles. acc.acc4_Deep 30% - - - - increases damage. acc.acc5_Sober - 30% - 2 - increases accuracy and gives tech. Barrel.barrel1_Dahl_Penetrator - - 150% 2 150% Add 3 rounds. -100% burst fire count. "Penetrator"/ High fire rate, fully automatic. Body.body2 10% - -20% 1 -30% "LB"/ slightly increases damage, slightly decreases fire rate, adds recoil, and adds a little tech. Body.body5 20% - 50% 1 20% "PPZ"/[Preferred] increases damage, increases fire rate, reduces recoil, and adds a little tech. mag.mag2 - - - - - gives no stat bonuses. mag.mag5 - - 21% - - Add 2 rounds. 50% reload speed, increase clip size, increased fire rate and a faster reload speed. 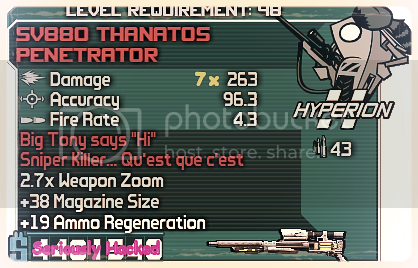 mag.mag5_Hyperion_Executioner -100% - 500% 1 - Add 10 rounds. 50% reload speed. 400% burst fire count & fire rate only when zoomed. "Executioner"/ Fires 5 round bursts when zoomed. Prefix.Prefix_Acc1_Brisk - - - - - "Brisk"
Prefix.Prefix_Acc4_Deep - - - - - "Deep"
Prefix.Prefix_Acc5_Sober - - - - - "Sober"
Prefix.Prefix_reload1_Vicious 15% - - 3 - 80% reload speed. "Vicious"
Title.TitleM_Hyperion1_Executioner - - - - - "Invader" "BAM BAM BAM BAM BAM! "/Name is glitched, appears as "Invader" instead of "Executioner" in game. Title.TitleM_SandS1_Orion - - - - - "Orion" "A hunter lives among the stars…"
Title.TitleM_Torgue1_Cobra - - - - - "Cobra" "I LIKE IT!" Title.TitleU_Reaver_ReaversEdge - - - - - "Reaver's Edge" "The cutting edge"
Title.TitleU_Retail_Rider - - - - - "Rider" "Careful… you might put someone's eye out." Title.Title_Accuracy1_Lance 15% - - 1 - "Lance"
Title.Title_Damage1_Driver - - - - - "Thunder"
Title.Title_Tech1_Wrath 25% - - 4 - "Wrath"
UniqueParts.ReaversEdge_Material - -15% - - 20% This material shares traits with other Dahl materials/ "D"
UniqueParts.Ryder_mag5 -200% - 100% - 400% This is responsible for the increased fire rate and ammo capacity/ +15 rounds/ 50% reload speed. 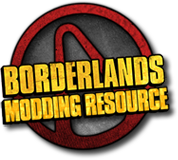 UniqueParts.Ryder_Material - - - - - has absolutely no modifiers/ "D"